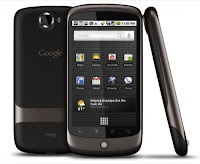 We do not intend bandwagon of speculation and rumors about the Nexus One. But, without the slightest review smart phone made by HTC before the Consumer Electronic Show (CES) in Las Vegas in next month, it's really not nice. Nexus One is a phone that most attracted the attention towards the close this year, mainly because publicity of that cell phone pictures on the Internet and provoke widespread publicity. Surprisingly, the Google, which provides mobile phone operating system, it is not too much to react. The phone is run on the latest version of Google's Android, the Android 2.1. They are designed and manufactured by HTC, smart phone vendors from Taiwan. Its features include a touch screen measuring 3.7-inch AMOLED. He also features a 5 megapixel camera, Wi-Fi, an accelerometer, and work on GSM networks. Actually there's nothing very recently on this phone. Android operating system itself has been circulating on the market since a year ago.